Wednesday October 12th is Ride to Work Day 2011. 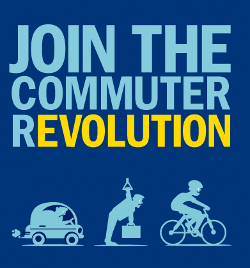 Join the 1000s of others who will ride their bike to work on Wednesday, many of who doing it for the first time. Bicycle Network Victoria (formerly Bicycle Victoria), promotes and co-ordinates ride to work day each year. Many workplaces and community groups are providing support and advice to those wishing to try cycle commuting, and are organising breakfasts for riders on the day. The City of Greater Geelong, with the support of local businesses, is again hosting a Ride to Work Day breakfast in the city from 7am to 9am. Note that the location has changed this year, with the breakfast moving to Gore Place. In addition to a free breakfast, entertainment and give-aways will be provided. Prizes will be awarded for the Best Helmet Hair, Best Dressed Rider, Best Decorated Bike and the Biggest Effort to Ride. BUG committee members will be taking part in the GoGG Ride to Work Day breakfast. Look for them in their white polo shirts so that you can ask their advice, tell them your concerns, or just have a chat about cycling matters. Participants of Ride to Work Day 2011 can register at ride2work.com.au.